According to John 12:3 the woman in this passage of Scripture that anointed Jesus with the costly oil of spikenard was Mary, the sister of Martha and Lazarus. After she had broken the flask of oil over His head, she knelt down and wiped His feet with her hair. She worshiped Him with all that she had; her savings and her very being. 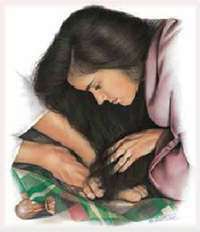 It is noted in John 12:3 that this was a pound of the fragrant oil that she broke over Jesus’ head. It was valued at a year’s wages. Mary was described in Luke 10:39 as one who sat at Jesus’ feet and heard His word. Jesus said she had chosen that good part which would not be taken away from her. Mary was a worshiper! She loved Him and worshiped Him without caring what others thought of her. But notice that even though she was a worshiper there were those in her midst that did not share her worship of Jesus. In fact, her worship brought out their indignation! They sharply criticized her for worshiping Jesus with that valuable a gift. And yet Jesus upheld her for what she did! He chastened them for being critical of her. In fact, He went on to say that wherever this gospel is preached in the whole world, what she had done would be told as a memorial to her! God desires our worship! When the praises go up, the glory comes down! I love to sing praise and worship songs as I worship Him. I have found that praise and worship music helps me to quiet myself before the Lord as I listen for His voice. It draws me into His presence. There was a time when my life was in such a turmoil that I would sit in the dark in my rocking chair and listen to worship music just to calm my soul. I needed the music to still my heart in the midst of the storm. It is recorded in 1 Samuel 16:23 that when a distressing spirit would come upon Saul he would call for David to come and play his harp and the distressing spirit would leave as David worshiped the Lord. There is something about our worship that draws us to the Lord and away from the evil that tries to distress us. Psalm 22:3 But You are holy, Enthroned in the praises of Israel. God is enthroned in the praises of His people. When the praises of believers go up to God it builds a throne for Him to sit upon! How precious are our praises to Him! It brings His presence into our midst. He inhabits, or takes up residence, in the praises of His people! Last weekend I was honored to help with some revival services in North Carolina. As we worshiped the Lord there was a point in time when it seemed as if the air became charged with the anointing of the Holy Spirit. The atmosphere was heavy with the presence of the Lord. You could sense Him right there in our midst. He came and inhabited our praises! I listened as people’s hearts were broken before Him as they worshiped Him. The word for “truth” here is the Greek word aletheia, which according to Strong’s Concordance #225, means veracity, reality, sincerity, accuracy, integrity, truthfulness, dependability, and propriety. It is the opposite of fictitious, feigned or false. To worship in spirit and in truth is to abandon yourself to God without pretense, worshiping Him without worrying about what others think of you or how you are perceived by those around you. Isn’t that what Mary did when she broke that costly flask of oil over Jesus’ head? Don’t you think she somehow knew that she would be criticized for her worship of Him in that manner? And yet, she worshiped with her whole heart and expressed it even through her finances. She gave all to Jesus! We sing that old song, “All to Jesus, I surrender; all to Him I freely give.” And yet, do we really give Him our all? Yesterday a dear sister in Christ brought back to my remembrance an old worship song that we used to sing back in the early 1990’s. It brought back so many memories of my worship of Him at that time. I love to simply throw my head back and raise my hands in total abandonment as I worship Him. He is worthy of our worship! Lord, I worship You today! You are so worthy, Lord; and I lift my hands and my heart up to You as I offer up this praise unto Your name! Thank You, for abiding in my praises, Lord! Thank You for Your presence that drives out the darkness and distress! Thank You for receiving my worship today, Father! I know that You will never turn me away. You are always ready to receive me when I come before You in adoration and worship. You are great and greatly to be praised! All glory be unto You, Lord Jesus! Worthy is the Lamb Who was sacrificed before the foundation of the world for the sin of mankind! You are glorious and worthy to be adored! I worship You, Lord, and welcome You into my life today! In Jesus’ name I pray. Amen.